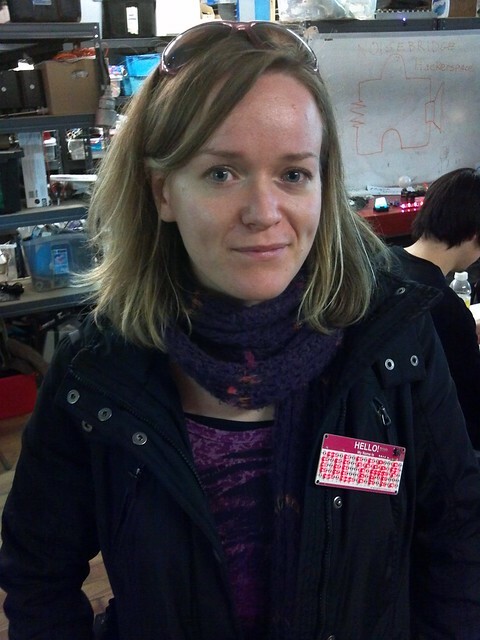 Olya built this name tag at Noisebridge last Monday at Circuit Hacking Monday. I really love the wide-letter font she came up with, especially the exclamation point. I’m planning on swapping out the current one for hers, it’s much nicer. I’d love to hear about / see and other fonts or font suggestions out there. If you have one, please get in touch. If you’re interested in building your own LED name tag, stop by Noisebridge on Mondays. This entry was written by larry, posted on December 17, 2011 at 6:46 am, filed under Uncategorized and tagged nametag. Leave a comment or view the discussion at the permalink.